Raising Money for "Lady Al-Qaida"
A Northeastern University Muslim chaplain, who also is a Roxbury, Mass. imam, hailed a terrorist convicted of attempting to murder Americans in Afghanistan as "brave," while painting the United States as an oppressive nation of infidels. "They say that she took up a machine gun while they held her captive in the other room and was ready to attack her captives. 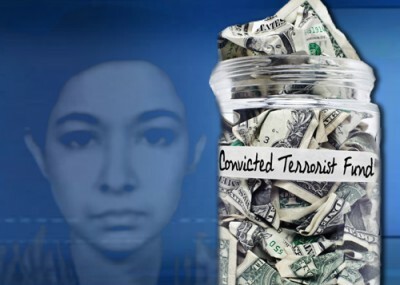 What a brave woman she is," Abdullah Faaruuq said at a Dec. 8 fundraiser for Aafia Siddiqui. Siddiqui, a Pakistani scientist also known as "Lady al-Qaida," is serving an 86-year prison sentence after being convicted of attempting to assault and murder American officers in Afghanistan. Prosecutors say she grabbed an Army officer's M-4 rifle and fired it at another officer and other members of a U.S. interview team at an Afghan police compound in July 2008. She was originally detained by Afghan officials who found in her possession notes about a "mass casualty attack" in the United States, along with a list of New York landmarks. The fundraiser, "In Support of our Sister, Dr. Aafia Siddiqui," was held at the Islamic Center of Worcester. Speakers repeatedly cast her prosecution and conviction as unjust. "What a brave woman she continues to be, and how much her bravery and her faith and her belief warrants our support at this time," said Faaruuq, an imam at Roxbury's Mosque for the Praising of Allah. "It is said that we're trying to raise $30,000 tonight. I would say it's better that we've raised your awareness and raised your ire, as your anger against a government who would level the charges that they have against this woman and they say she is guilty. I would say she's only guilty of defending herself." In addition to lauding Siddiqui's "bravery," Faaruuq also condemned American soldiers, the very people who defend America, as "kafirs," meaning infidels. "And if my mother was in the same place," he said, "she would have took (sic) her West Indian machete and cut her way through those kafirs." He repeated an unsubstantiated claim that Siddiqui was abused while in custody. Muslims around the world are "cowering at the hand of the disbeliever," Faaruuq said, "and this one woman locked up deep down, possibly raped and abused, and they're saying that she was a terrorist, afraid of a 100-pound woman. And I say they call this the land of the free and the home of the brave. And I call it the land of the coward and the home of the slave." The presiding judge who reviewed all the evidence saw things differently. U.S. District Judge Richard M. Berman said "significant incarceration" was called for because Siddiqui's acts were premeditated. In his sentencing, he also noted anti-American statements witnesses said were made by Siddiqui while firing on the soldiers, like "I want to kill Americans" and "Death to America." It's not the first time Faaruuq has engaged in violent rhetoric while standing up for Siddiqui. Charles Jacobs, president of the Boston-based Americans for Peace and Tolerance, wrote in October that Faaruuq sees cases like Siddiqui's as part of an effort to target Muslims in America. Muslims should "grab onto the gun and the sword, go out and do your job" in response, Faaruuq said. Faaruuq also is advocating for Tarek Mehanna, on trial in Boston for conspiring to support terrorists and to kill Americans in a foreign country. Also coming to Siddiqui's defense at the fundraiser was Imam Siraj Wahhaj of the Masjid Al-Taqwa mosque in Brooklyn, New York. Wahhaj has a history of defending convicted terrorists, listed as an unindicted co-conspirator and having served as a character witness for Omar Abdel-Rahman, the so-called "blind sheik," convicted of conspiring to bomb the World Trade Center in 1993. While acknowledging that he knew little about Siddiqui's case, Wahhaj provided a long explanation of the American judicial system and highlighted its perceived flaws. "How many people do you think are wrongfully convicted in the United States every year? About 10,000 people, 10,000." After suggesting that Siddiqui might be one of the 10,000, he pledged $500 to her cause. "But I will tell you this. I studied the case a little bit. I think that she innocent. And I think at least there is grounds, there's reasonable doubt. And by law, if there's reasonable doubt, you have to acquit." The Muslim American Society also has supported Siddiqui, claiming her "conviction is seriously flawed and her kidnapping and detention is a grave violation of human rights and international law." We mere mortals don't know nothing 'bout nothing when it comes to A.S. But I'd wager the gun charge was just a quick and easy way to get her behind bars and begin asking questions. She's not AQ. She's connected to whatever it is that spawned Ramzi Youssef and KSM and the rest of the family. And till now, the military isn't saying much, nor are any other feds. The six 'family' members currently in custody are as mysterious now as they were five years ago.